Spoiler: A link to the best ever Vegetable Lasagna recipe can be found at the end of this post. My teenage son became a vegetarian this winter, so I’ve been cooking more meatless dishes whenever possible, or altering my meat-containing recipes (such as soups and stews) so that I can add protein separately. For years I’ve seen recipes for zucchini lasagna and it never sounded very exciting to me, but I love vegetables and want to find new ways to use them in meals other than the usual sauteed or steamed side dishes. Now, in early summer when our vegetables start maturing, I usually end up with one of this, one of that, an undersized other—not enough for a complete meal’s side dish. A recipe for homemade ricotta cheese I found through Pinterest promised to make the best tasting ricotta in about 15 minutes. That caught my attention—and imagination. Thinking back on one of my favorite vegetable pasta dishes, Pasta Primavera, I came up with my own vegetable lasagna dish that totally knocked my socks off! Not only was it one of the best lasagnas I’ve ever had, but it was easy! I already had most of the vegetables I needed. After a quick trip to Whole Foods I also had ricotta ingredients, pasta sauce, mozzarella and lasagna noodles. I decided to try Whole Foods’ 365 brand no-cook lasagna noodles. That saved me some time right off the bat—no cooking, rinsing and keeping the noodles unstuck for my recipe. 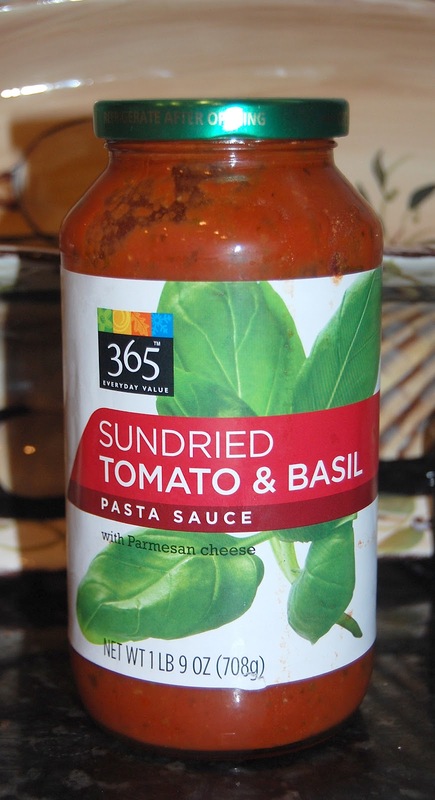 I also found a new 365 pasta sauce I’d not seen before—Sun Dried Tomato & Basil. That turned out to be a very fortuitous choice! I have to say I LOVE this sauce. It’s so good that it tastes great cold, right out of the jar. I think it would be a fantastic dip for pizza-dough breadsticks or as a quick and easy bruschetta. It has incredible flavor, thick sauce and lots of chunks of tomato. Belissimo! I made a double recipe of ricotta and yes, it was so quick and easy that I don’t know why I haven’t tried that before. It’s extremely fresh tasting, sweet and delicious! I julienned the vegetables, sauteed them in olive oil until they were only slightly softened and then set up my assembly line on the kitchen island: sauce jar, raw lasagna noodles, ricotta bowl, vegetables, shredded mozzarella. I used an 8×8 Pyrex baking dish. I layered my ingredients, baked at 350 for about 45 minutes and voila, pulled the bubbling beauty from the oven. The vegetables were perfectly al dente, the ricotta sweet and rich, the sauce an enticing combination of flavor and texture. The pasta was cooked perfectly! My guest even spontaneously commented on how delicious and satisfying this meal turned out to be. It was SO good that I had cold leftovers for breakfast the following two mornings. And as for my son? I had actually made this dish for him. But between his night job at Noodles & Company and spare time spent with his girlfriend, he didn’t have a chance to even try it. One of life’s little ironies! My vegetable lasagna recipe can be found here. This entry was posted in best lasagna recipe, best vegetable lasagna, homemade ricotta cheese, vegetable recipes, vegetarian recipes on May 31, 2012 by Farmer Deb.